Autumn brings changes in the light, even if it’s still warm on the mountain. When winter approaches and the leaves begin to drop things that are hidden come into view. You might see little splashes of red here and there in a thorny thicket. Chances are you’re seeing rose hips—the fruit that’s left after the flowers drop their petals. Rose hips can be a tasty treat if you know when to pick them. And they’re a major source of nutrients for birds and small animals. On Mt. Laguna we have wild roses along many of the streambeds. There are a number of thickets along Los Huecos Road, near the seasonal stream that runs down toward the meadow. You might want to continue on the trail that leaves Los Huecos Road about a mile and a half from the Visitor Center. Once it drops down near the streambed there are more stands of roses all along the stream. 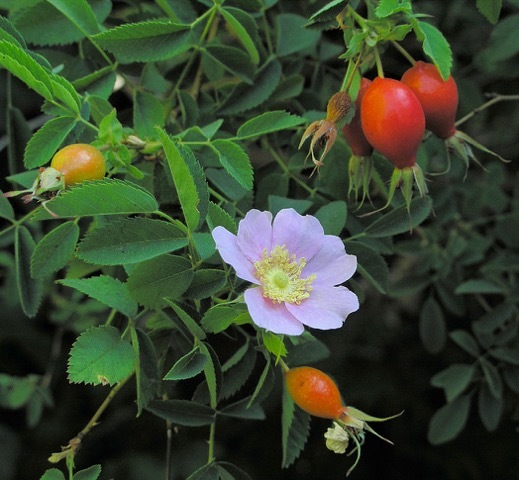 The time to pick rosehips is after the first frost, which concentrates the sweetness in the fruit. Since the hips are very seedy and hairy in the center, it’s best to separate the sweet-tart outer flesh from the seed pulp. Some years there are few hips and others have bumper crops. Rose hips can be collected as late as February in some years, but usually it’s best right around Thanksgiving. There are some simple rules for collecting in the wild. First, never take all the fruit off a plant. Our wild friends depend on these fruits for nourishment during the winter. A personal rule is to only take less than 1/10 of the fruit on any one plant. There are so many stands of wild roses on the mountain that you can get plenty this way. Be sure to wear long sleeves to protect your arms—those thorns are sharp! Rose hips make great tea. You can use them fresh—just take a handful of whole, fresh hips, crush them up in the bottom of a small teapot, pour one or two cups of boiling water in. Steep for 10 minutes, then strain, add honey and sip. Delicious! For longer-lasting treats, either dry the rosehips or make rosehips brandy. Drying hips can be a bit tedious, but in a bumper crop year it’s worth it. You need to cut each hip in half, scrape out the seedy pulp and leave the tender flesh that’s on the outside. Then place the deseeded hips in a single layer on a screen or in a basket that gets good air circulation. Leave them to dry for about two weeks in a warm dry place. Check periodically to make sure they’re not getting moldy. When they’re dry, put in a jar and keep in the tea cupboard. Rosehips brandy is simple to make. Take one cup of fresh rosehips. Remove any grit—rinse and let dry if necessary. Place the rosehips in a fresh mason jar. Crush them slightly with a fork or spoon. Add good brandy to the jar until it covers the rose hips. Then add a little more. Make sure there’s enough brandy to keep the rosehips wet all the time. If you don’t like the taste of brandy, you can use vodka instead. Put the jar someplace in your kitchen where you can shake it every day. Shake it two or three times a day for a month. After that you can strain out the pulp and keep the brandy in the cupboard. If you want to leave the pulp in the brandy longer, that’s fine. I’ve left some macerating in my cupboard for up to a year before straining. Not only does rosehips brandy taste great, it’s good medicine too! For a great cough syrup, take 1T rosehips brandy and 1T honey, mix and use. You can mix rosehips brandy and honey in equal parts and keep in a jar during the winter for treating colds and flu.